The item High peaks : a history of hiking the Adirondacks from Noah to neoprene, Tim Rowland represents a specific, individual, material embodiment of a distinct intellectual or artistic creation found in Evansville Vanderburgh Public Library. The unique geological history of the Adirondacks can be found in a pebble. 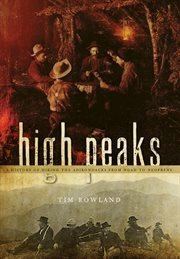 So discovers humorist and outdoorsman Tim Rowland as he chronicles the evolution of hiking in the howling wilderness of the High Peaks. From nineteenth-century guides' "random scoots" to Melville Dewey's "Adirondaks Loj" to today's technologically enhanced weekenders, Rowland, who has climbed the forty-six himself, incorporates personal anecdotes and laugh-out-loud wit to capture the appeal and beauty of this beloved region, all the while reminding us of the importance of keeping these stunning mountains, and their attendant "neat rocks," "Forever Wild."